Earlier today, Apple released iOS 4.3.5 for iPhone, iPad and iPod touch. 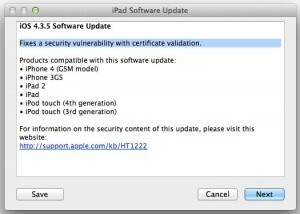 The update, apparently critical given the fact that Apple released it less than a week after it released iOS 4.3.4, “fixes a security vulnerability with certificate validation.” The update, dubbed iOS 4.3.5 build 8L1, is compatible with iPhone 3GS & 4, iPad 1 & 2, as well as third and fourth generation iPod touch. iOS for the Verizon iPhone 4 has also been updated, and moved to version 4.2.10 build 8E600. To update your device, simply plug it to your Mac or PC, launch iTunes, and click on ‘Update’. If for some reason, you prefer direct links to the firmware, simply click on the link for your device below.